New York : Random House, c2007. 119 p. : ill. ; 21 cm. First grader Junie B. Jones is determined to win the grand prize at wealthy classmate Lucille&apos;s Easter egg hunt--a playdate in Lucille&apos;s heated swimming pool. 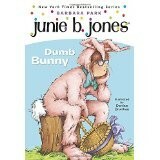 Junie B., first grader : dumb bunny / Barbara Park ; illustrated by Denise Brunkus. 100 ME:PersonalName 1 $a Personal name Park, Barbara. $c Statement of responsibility Barbara Park ; illustrated by Denise Brunkus. $c Date of publication, dist, etc c2007. 520 Summary $a Summary, etc. note First grader Junie B. Jones is determined to win the grand prize at wealthy classmate Lucille&apos;s Easter egg hunt--a playdate in Lucille&apos;s heated swimming pool.